In a pre-election party political broadcast called the Autumn Statement, the Chancellor was at pains to tell us that his ‘long-term economic plan’, which he echoed 15 times like a demented obsessive perhaps to cover up that he doesn’t actually have one, was firmly on track. The economy had been saved from ruin and was now on its way to prosperity. It was like a surreal dream. But one area of this magnificent future that he chose not to mention was the state of the finance sector, always the most dangerous and potentially explosive sector in a capitalist economy. Hardly surprisingly since the Tories get more than half their income each year from the banking and shadow banking (hedge funds, money market funds, etc.) systems and the whole finance sector remains wide open to abuse. Of course that will never be admitted, least of all by Osborne who likes to regale us with another of his canards that there has been a major clean-up exercise since the crash in 2008. There hasn’t. The Financial Conduct Authority (FCA), walking on eggshells, suggested gingerly that the banks’ clean-up policies were ‘high level’, there was insufficient training and guidance on how these policies applied to foreign exchange basis, oversight was inadequate, and monitoring was not designed to identify the misfeasance found by the FCA. In other words, the banks’ bosses were just going through the motions, not expecting or even wanting to find anything amiss. Their response to criticism over previous scandals has been hopelessly flabby. All those pious words about raising ethical standards and cleaning up the culture were just so much flannel. Worse, the traders left an incriminatory trail of foul language showing that that these denizens of the trading floors are closer to the animal kingdom than the rest of our (unjailed) population. The truth is, they were and still are bonus-driven hired guns bereft of any loyalty or accountability to anyone – their own banks, customers or markets. Their presence pollutes the financial system, and is like the Augean stables in Greek mythology which Hercules cleaned out methodically by diverting the course of a river. Clearly the culture of the world’s biggest banks is fundamentally rotten. Why do they behave like this? Because they can get away with it. And that will continue until sanctions are put in place which are genuinely deterrent. Fining a bank even large sums (the low billions) will have limited effect – and is indeed becoming accepted as merely the costs of business as usual – because it bleeds the shareholders, including taxpayers in the case of the publicly owned banks, not the directors and executives who are the ones really to be targeted. It is a supreme scandal of the post-crash era (6 years now) that not a single top executive at any bank in the UK has been sent down, even for the most egregious misfeasance. That needs to change. Surprised that Osborne didn’t mention it? 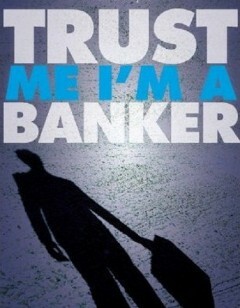 Trust me I’m a banker…. Trust me I’m a politician. Why would you trust any of them.